Frenchman Street is the live music and entertainment district in New Orleans’ French Quarter. The three-block area of the Faubourg Marigny neighborhood is home to the best live music in Louisiana, and offers premier galleries, shops, restaurants, and bars. More than 20 bars and nightclubs offer live music across all genres, performed by local musicians and performers from all over the world. As New Orleans’ Bourbon Street grew in popularity with tourists, Frenchman Street became known as a place for locals to enjoy food and music. The area is known for embracing authentic Louisiana culture. The street is home to several Creole cottages, many over 100 years old. The small, single-story structures set close to the street have sharply pitched roofs and front porches reminiscent of Caribbean architecture. The Creole townhouse is another prominent architectural style. The two to four-story structures feature iron balconies on the second and third levels, and steeply pitched side gabled roofs. Most are made of stucco or brick. The jazz club Snug Harbor is among the most popular entertainment venues in the district. The club was established in 1983 and has been named a “musical landmark” by Rolling Stone Magazine, and the New York Times has called it “the classiest jazz club in New Orleans.” The Spotted Cat, known as “The Cat” to locals, is another of the most famous jazz clubs and has been featured in commercials, movies, and print media, which highlights its outstanding music and ambience. Bamboulas is a beautiful venue located in a historical print shop. They offer music and meals 7 days a week. Many of the neighborhood’s restaurants also offer live music, including The Maison, a three-story jazz, brass and funk venue, and Marigny Brasserie, which offers a chef-driven menu and hand-crafted cocktails. Lodging options include hotels, guesthouses, and small inns. Bed and breakfasts include the Marigny Manor House, a restored Greek revival home from the 1840s, the Royal Street Courtyard, an 1850s Greek revival Creole townhome, and the Elysian Fields Inn, a historic Creole cottage. The Faubourg Marigny neighborhood, just down the street from the Vieux Carre, or French Quarter, is one of the oldest and most well-known neighborhoods in New Orleans. The neighborhood was originally part of the estate of Bernard de Marigny, a wealthy Creole leader who subdivided his own plantation into housing in 1806. Marigny was a charismatic man who embraced the Creole joie de vivre, or joy of life. He was known for his love of entertainment and music as well as for his influence in the popularizing of the dice game craps. The neighborhood today keeps Marigny’s spirit alive as the official entertainment district of New Orleans. A number of tour packages are available to suit any event or interest. The Frenchmen Street Stroll and Walking Tour begins at the Old Mint Building and guides visitors on a 1-hour easy walk while pointing out the history of the area. Guests can see Louis Armstrong’s first trumpet and get inside advice on which clubs and bars offer the best local live music. The Frenchmen Street Cocktails and Music Tour offers a sampling of Creole food, cocktails, and live music. Bartenders give demonstrations on how to mix local drinks, while restaurants present local dishes. The tour begins at Dragon’s Den, a live music venue offering some of the city’s most diverse music programming. Tour groups can assist with reservations at any of the clubs and restaurants, including VIP access, bottle service, jazz brunch reservations, and more. In 2010, when New Orleans hosted the Super Bowl, Frenchmen Street was host to one of the largest official afterparties. Today, bands playing on Frenchmen Street run the gamut from modern to traditional to New Orleans jazz. Visitors can hear blues, funk, brass, Latin, or soul and it’s not unheard of to stumble upon pop music artists sitting in with a local group. Past impromptu performances have included appearances by Snoop Dog, Stevie Wonder, 50 Cent, Common, Quest Love, and even Bill Murray. 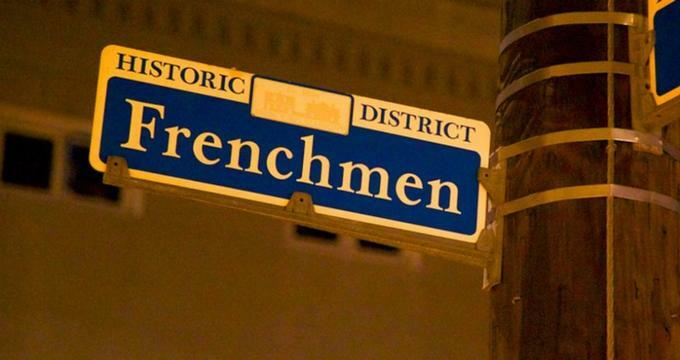 The historic French Quarter is located at the end of Frenchmen Street. The Vieux Carre district is the oldest in New Orleans and has been designated as a National Historic Landmark. Most of the existing buildings were built in the late 1700s and early 1800s around the time of the 1803 Louisiana Purchase.